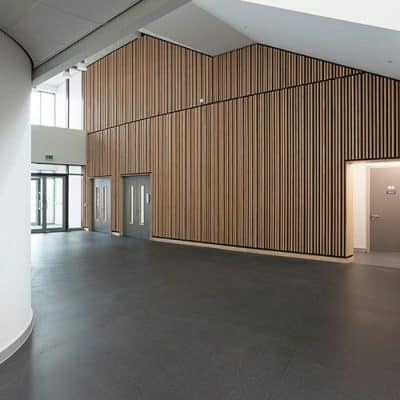 We supply and install all types of flooring products for use in the commercial sector. Plus, we are key suppliers of Altro & Polyflor commercial flooring. Because we have been doing this for over 30 years, we understand how important it is for these floors to be hard-wearing and slip resistant. Let us arrange a site visit and advise you on the most suitable materials for your project. We can then provide you with the best floor solutions and a competitive quote. Polyflor is a leading brand for commercial vinyl flooring. Polyflor flooring solutions are ideal for commercial flooring as hygiene and practicality are always at the forefront of their design. Their range includes high-performance homogeneous flooring, non-slip safety flooring and sound reduction acoustic flooring. See their full range here. Altro flooring solutions include hard-wearing, durable and slip-resistant options. Altro is the perfect choice for you if you are a school, nursery, dentist, doctor surgery, hairdresser or high footfall area. Altro’s Smooth and Safety flooring systems are amongst our best commercial flooring sellers. See their full range here. We also offer Polyflor and Altro for home floors so please visit our other pages. Once you have selected your commercial floor coverings our team of experienced, fully qualified floor layers will complete the installation. As part of floor installation, we also uplift and dispose of your existing flooring, move and replace furniture and trim your doors if required.